Quench your thirst for all things wet and wild by trying out these great water sports in Grenada. Grenada as lots of activities both on and under the water. Our water sports operators are experienced, safe and professional. Why not try scuba diving on Grenada's beautiful reefs or snorkelling over the world's first underwater sculpture park? Looking to get back to nature? Try kayaking or stand up paddle boarding around the thriving mangroves and protected marine parks. For those who like thrilling action there is jet skiing, flyboarding or power boat tours! Grenada is the largest of the three sister islands; diving is predominantly along the west and south coast, where the Caribbean Sea meets with the Atlantic Ocean. The smaller sister island of Carriacou is home to wrecks, pretty coral reefs and wall dives. With over 40 boat diving sites to explore, mainland Grenada offers a full selection of exciting wrecks and relaxing reefs. Varying from plateau patch reef to sloping coral gardens, the marine life is abundant, and divers can expect to see all the common Caribbean reef fish. Eels, turtles, nurse sharks, and rays are frequent visitors to both wrecks and reef. More unusual critter life is found at the shallower sites such as frogfish, blennies, and nudibranchs. Click here for information about Grenada's dive centers. Grenada is beautiful and to fully appreciate the true wonder of what this amazing island has to offer you need to go to places that can only be visited by kayak. Jamie and Amber, who run Conservation Kayak, can help you do just that. If you’ve never kayaked, don’t worry, they’ll teach you. You can paddle out to a deserted island, see a diverse array of the beautiful flora and fauna found in Grenada and, if you’re feeling up for it, swim in the warm, blue sea. As you glide amongst the coral reefs and mangroves you will soon forget what time it is and you’ll begin to feel at one with nature. S & S Kayaking is another reputable company who offer clear bottom kayak tours along the west coast. A fantastic journey which will take you to the coral reefs and Marine Park. The Grenada Marine Park (MPA) is home to many shallow reefs, small wrecks, and the stunning Underwater Sculpture Park. Founded in 2006, by sculptor Jason DeCaires Taylor and the Grenadian Ministry of Tourism & Culture, the park promotes ecological regeneration and sustainability. Frogfish, turtles and a variety of eels are common, with large amounts of schooling fish. Divers and snorkellers can tour the unique sculptures and explore the hard and soft corals found on the surrounding reef. All of the dive centers offer snorkelling trips to the Marine Park, as do many other tour and water sports operators. SUP Grenada is the first dedicated stand up paddle board company in Grenada. They offer SUP stand up paddle board rentals tours and lessons. Located on the calm protected BBC beach, SUP Grenada offers hourly stand up paddle board rentals, lessons and fitness classes. SUP Grenada offers downwind tours over beautiful coral reefs, where you could choose to stop and snorkle, or just enjoy the amazing scenery. Other eco tours include a full moon, or bio-luminescence tour. The owner and operator is a paddle board, scuba and kiteboarding instructor who is fanatical about water-sports wake-baording, surfski, kayaking, he loves it all, and is stoked to introduce SUP to Grenada. Many of the major beachfront hotels have their own hobie cats for guest use. If you are experienced then you may take them out for a spin, or, if you are a beginner their water sports staff will assist you. Eco Dive on Grand Anse beach hires out hobie cats to visitors for hourly spots. So if you miss the wind in your hair after your sailing course you can get out for a spin. Whilst not in Grenada, this fun kitesurfing company is easy to visit with an island hopper flight. 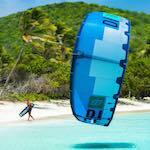 Take a couple of days out of your vacation to visit JT Pro Center Kitesurfing School on Union Island in the Grenadines. The center has gained a worldwide reputation and is now amongst one of the top destinations in the world (and in the Caribbean) to learn how to kitesurf. They offer a great service for advanced kitesurfers looking for a kitesurfing holiday or for the beginners looking to learn how to kitesurf for the first time. Rent a jet ski for one, two or three hours or go on a guided tour around the west coast with Grenada Jet Ski. Seaglass Flyboard and Watersports is located at the Allamanda Hotel on Grand Anse beach. Amazingly intuitive it requires no previous experience and within 5-10 minutes you’ll be out of the water and flying around! Whatever you height, weight, age or fitness level you are guaranteed an unforgettable fun experience. Grenada Seafaris Powerboat Adventure Tours offer guided power boat tours and snorkelling trips to the Underwater Sculpture Park. 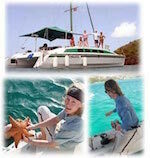 Fun, family adventures on the fastest tour boat in Grenada. Mixing sightseeing with snorkelling in the world's first Underwater Sculpture Park. Top quality service, attentive and friendly crew make this an experience not to be missed when on island. A number of local operators run regular day trips around the island, and these packages generally include leisurely excursions to nearby harbours and smaller islands with food, drinks, and a variety of water sports. Chartering a yacht for a longer trip is also an option and allows you to visit a wider variety of nearby islands. Whale and dolphin watching tours are available plus deep sea fishing charters. Check out the companies here.